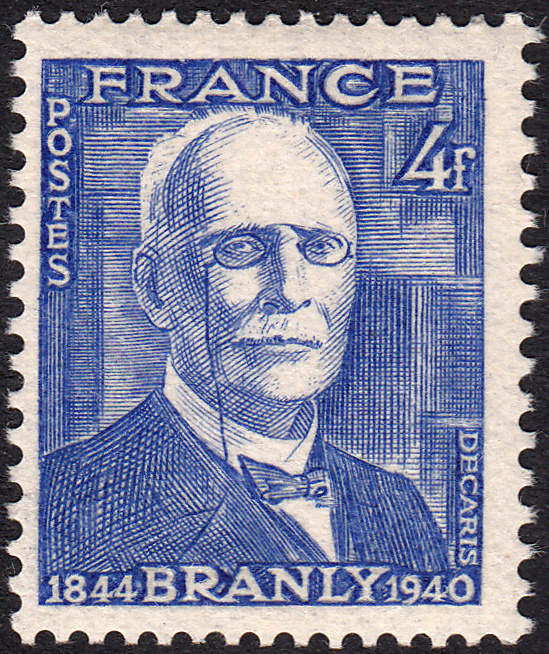 On 21 February 1944, France issued a stamp commemorating the 100th Anniversary of the birth of Édouard Eugène Désirè Branly. This stamp was designed and engraved by Albert Decaris. Édouard Branly was a Professor of Physics at the Institut Catholique de Paris. He was also an inventor. His best known invention was the coherer. Basically, this was a radio wave detector, which became the basis for radio communications. Branly's design was further modified by the likes of Guglielmo Marconi. For more info on the coherer click HERE. For his scientific work, Branly was three times nominated for the Nobel Prize, but he never won it. But in 1911, he was elected to the French Academy of Sciences. In gaining this prestigious position he beat out another name huge in the field of sciene, one Marie Curie. Apparently they were great rivals in the field. Let's take a look at the stamp designed and engraved by Decaris. The stamp has a face value of 4f. This portrait, still rather stiff for the style for which Decaris became renowned, is rather attractive. What do you think?